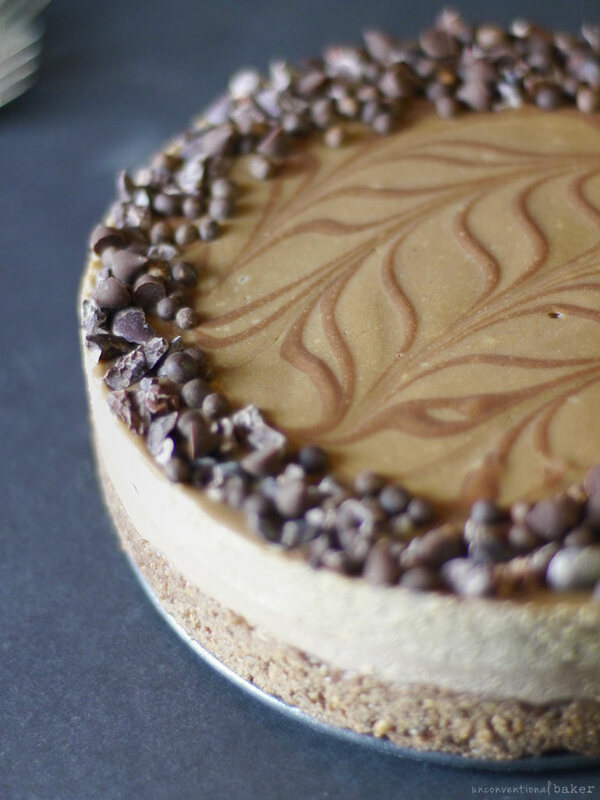 When you have chocolate + espresso + salted caramel in the mix, you’re bound to end up with a pretty epic cake, right? 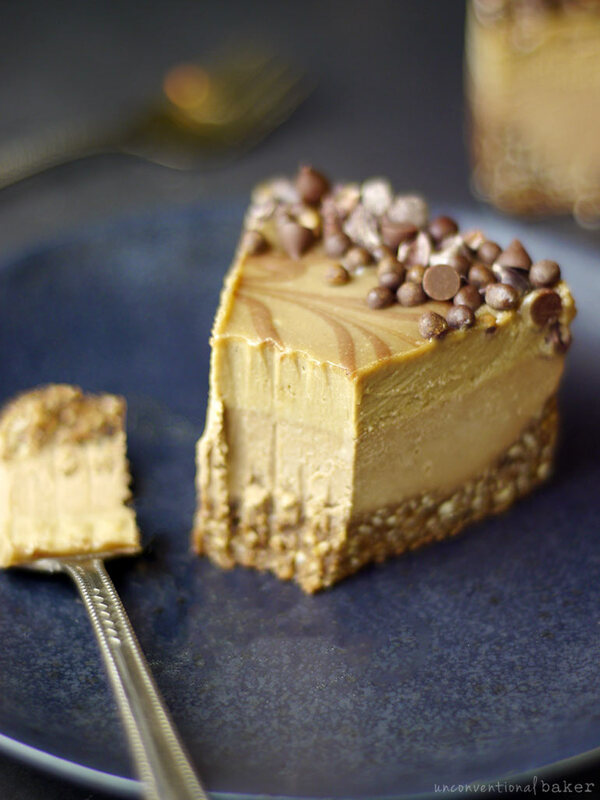 This layered vegan cheesecake is deliciously creamy and dreamy and comes together in a breeze (as most raw cakes do). I got a request from someone on Instagram to make a salted caramel cheesecake last week, and I thought well, it’s been a while since a caramel cake happened + caramel is one of my absolute favorite flavors in the world, so why not. And so this lush layer cake was the result. Although the espresso was not called for in the request, I added it in to see what happens, after all coffee and a caramel are a delicious thing, and I loved that combo in this cake. *Can I skip the espresso powder? Yes, of course. It’s only here as a flavor and makes the cake extra special in my opinion, but at the same time it’s optional. Now back to this cake, I feel that perhaps the “chocolate layer” in the ingredients list might lead you to believe the chocolate layer in the filling is super chocolatey. In reality it isn’t. I used the cocoa here as a slight flavor accent. The chocolatey flavor in the cake comes mostly from the crust and the chocolatey toppings in the form of cacao nibs and little bits of chocolate. Just giving you a heads up here so you know what to expect. I wanted the salted caramel to be the star. Another ingredient in here that I feel is essential is the carob powder in the salted caramel layer. It’s a tiny amount, and a lot of the time people unfamiliar with carob lean towards skipping that ingredient — I have to say, try not to since it gives the caramel layer a caramely flavor. I highly recommend giving it a try. 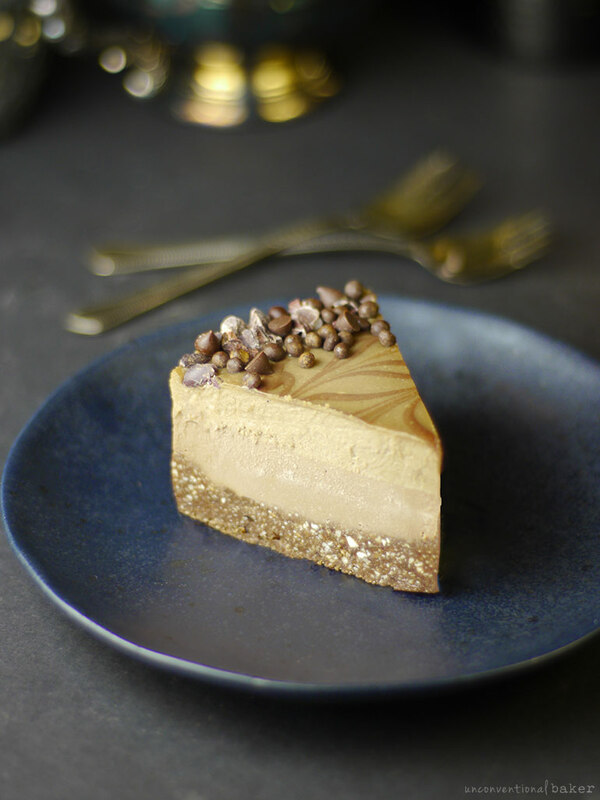 And once again, there are tons of carob recipes on this blog you can try out with the extra carob powder you get, like this delicious carob fudge, this carob hemp butter, or this cinnamon carob marble fudge cake. It comes raw and toasted — I used toasted here, but feel free to use raw if you prefer to keep this recipe more fully raw. 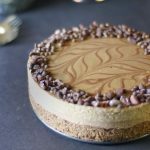 This raw vegan cheesecake (also gluten-free, of course) is probably one of my favorite dairy-free cheesecakes to date (and I make a lot of them! ), probably on account of its smooth and creamy texture and its rich and deep flavor. Also, I’m pretty sure the salted caramel has something to do with it — I have a weak spot for anything in that flavor. I hope you enjoy it as much as I did! P.S. 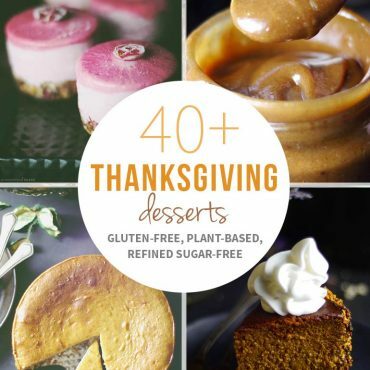 For tips on making raw cakes like a pro, check out my book Unconventional Treats. 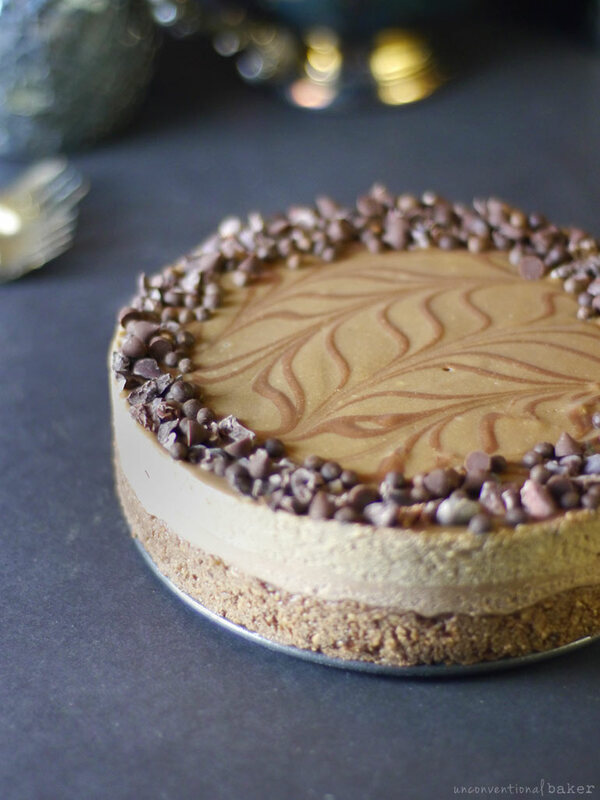 A deliciously creamy vegan cheesecake with layers of chocolate, espresso, and salted caramel. Also gluten-free, paleo, and refined sugar-free. 1. Process the cashews into a fine nut meal in a food processor. Add remaining crust ingredients and process again until the mixture forms a fine moist sticky crumble. Transfer to a 6″ springform pan and press down into an even crust along the base. Freeze while working on the next step. 2. Make sure all ingredients are at room temperature before getting started. Blend all base filling ingredients into a smooth creamy mixture in a power blender. Remove half of this mixture and set aside. 3. Add chocolate layer ingredients to the base filling in the blender and blend until smooth. 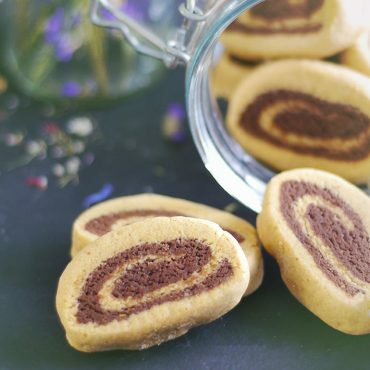 Optional if doing swirls: remove about 2 tbsp of the mixture with a decorating pen tool (or a mini pipping bag) and set aside for swirls later. Transfer the chocolate mixture from the blender into the prepared cake pan over the crust. Make sure the mixture fills the pan evenly. Freeze for 15-20 mins while working on the next step. 4. Clean out the blender pitcher. Add the remaining base filling that was set aside in step 2 to the blender along with the caramel layer ingredients. Blend until smooth. Carefully spoon this mixture over the chocolate layer in the pan***. Smooth out the top with the back of a spoon. 5. Optional: if creating swirls, draw parallel lines with the chocolate mixture on top of the cake. Then use a skewer and drag it through the chocolate lines in a perpendicular manner, alternating between going up and down on each line. You can also curve the skewering lines slightly to create a rounded swirl look. *Maple syrup isn’t considered a raw sweetener, so if you wish to keep this recipe more fully raw, use a raw sweetener of your choice, like raw agave, etc. **To pre-soak nuts: place in a glass bowl, cover with water, and leave to soak for 4 hours (or overnight in the fridge). Then strain and discard the water. For a quick pre-soak, cover with boiled water and soak for 15 mins, then strain and discard water. (Note: this technique doesn’t preserve the nutrition of the recipe as well as the traditional soaking technique above). Additional Note: the purpose of soaking the nuts is to re-hydrate them and plump them up for blending into a smooth, cheesecake-like consistency. Proper soaking techniques also maximize nutrition and digestibility. If you’re interested in learning more about nut soaking and other dessert prep tips and tricks, I delve into these subjects in detail in my book Unconventional Treats. ***Spooning the mixture on top bit by bit helps the layers to remain even. **** Storage notes: treat this cake like ice cream. Keep it cake frozen at all times until ready to eat, and freeze any leftovers. If left too long at room temperature it will begin to melt back into the consistency it was in the blender. I seem to have an allergy to cashews ( lump in throat and upper chest for 2-3 days after eating cashews… can I use raw almonds or macadamia nuts or something in place of cashews? Thanks for your consideration of my question. Hi Nancy. Sorry to hear that :( I can relate — there was a period when I was sensitive to cashews as well. For this specific I think it would be hard to swap out the cashews since they’re the main ingredient and make up the bulk of the cake + all the flavors are adjusted based on the underlying cashew flavor. You can use another nut, like macadamia, but the flavor and texture will be very different. I find for some reason that almonds don’t make the best raw cheesecakes. That said, I have a cashew-free section on my recipes page. So you can head over there https://www.unconventionalbaker.com/all-recipes/ and select “cake” + “cashew-free” and you’ll find lots of other cake alternatives that way :) I’ll try to make a cashew-free caramel cake in the future too. Thanks for the idea. 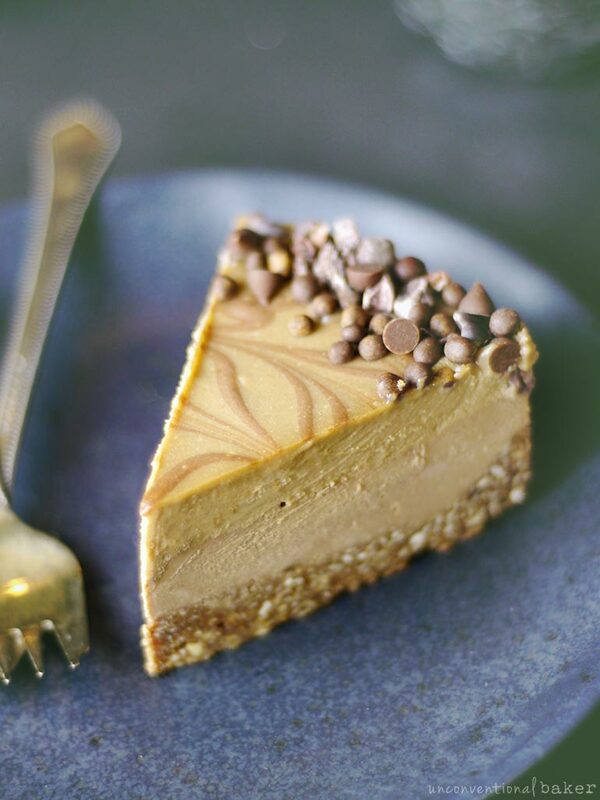 No doubt is this cheesecake a winner, both in aesthetics and flavor combinations! I am not surprised it is one of your favorites now because it definitely would be one of mine! The addition of a little salt and espresso are perfect for saltiness and bitterness that elevate the creaminess and sweetness. Save me a slice! This sounds super!! But… I can’t tolerate nuts. Is there any alternative to the cashews and almond milk? I am on the AIP, so ingredients are very limited. Was thinking maybe about coconut chips for the crust, but waht to use for the filling?? Hi Marelize. Nuts are a bit too central to this recipe to swap them out entirely and end up with the same product. I do have other cakes through that don’t involve nuts you might enjoy. If you look at the recipes page and select “nut-free” + “grain-free” (+ “whatever category you’re interested in or allergen you’re trying to avoid”) you should be able to find lots of tasty things that would work for AIP.